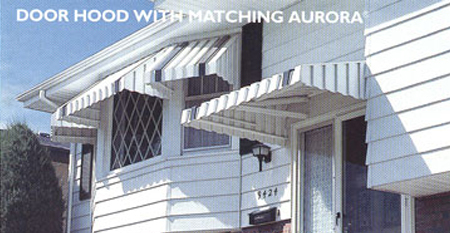 Over windows, doors or patios, our aluminum awnings are a decorative and functional addition to any home. The beauty of awnings is that they shield the heat and glare of the sun, keeping your home cooler and increasing energy efficiency during warm summer months. What's more, window awnings are effective at protecting your interior furnishings from the damaging rays of direct sunlight. 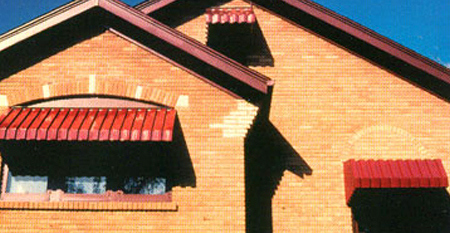 We have several unique awning styles to choose from. Natural Venting Action - Our Aluminum awnings have a natural venting action to help prevent heat build-up under the awning. The unique "pan and cover" construction helps keep rain, snow and debris from penetrating. Soft Light - Instead of dark shadows associated with most other awning styles, West awnings allow soft light to filter into your home. 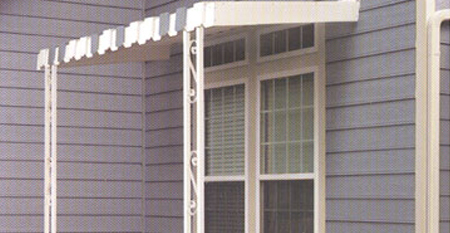 Appearance - While awning tops are available in a variety of colors and styles, the underside is always crisp and white. A minimal amount of fasteners are exposed, keeping the overall appearance trim and neat. 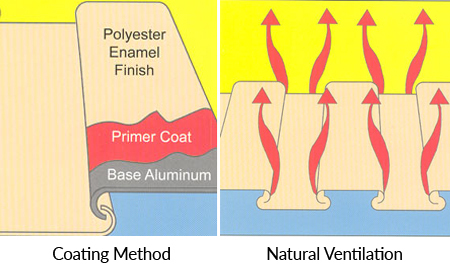 Durability - West aluminum awning panels are thoroughly cleaned, conversion coated, painted with an epoxy primer, and baked before a top coat of polyester enamel is applied. The result is a minimum maintenance surface that retains its good looks for years to come. The Aurora offers the greatest degree of protection from the sun. 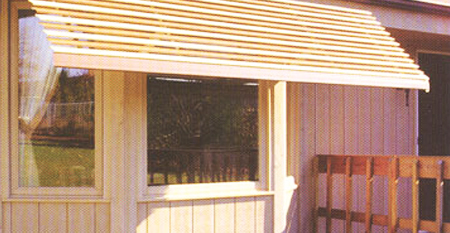 It's an ideal awning over windows and doors and makes an affordable patio cover as well. Patio awnings are perfect for parties, cookouts, and other entertaining activities. Patio awnings add shelter and shade to outdoor living and are custom built for your home to suit your space. The beauty of the panorama window awning is found in its design. Overlapping slats block the sun's rays without blocking your view. They are a sleek, contemporary addition to any home. Door canopies provide a warm, welcome, and sheltered entrance all year long. Beautiful and practical, door hoods will help protect your entry way from rain, sleet and snow, as well as providing solar control.